Amit Goswami, Ph. D. is a professor emeritus of physics (retired) at the University of Oregon, Eugene, OR where he has served since 1968. He is a pioneer of the new paradigm of science called ‘science within consciousness’, an idea he explicated in his seminal book, The Self- Aware Universe where he also solved the quantum measurement problem elucidating the famous observer effect. Goswami has written six other popular books based on his research on quantum physics and consciousness. His latest book, Creative Evolution, is a resolution between Darwinism and intelligent design of life. Finally, in his book God is not Dead, Goswami demonstrates science’s re-discovery of God. Goswami’s books have been translated in nine languages. In his private life, Goswami is a practitioner of spirituality and transformation. He calls himself a quantum activist. In this podcast, Dr. Amit Goswami discusses with Merryn Jose how his childhood influenced his work how a conference in 1973 inspired an awakening for him upward and downward causation non-local consciousness where we go wrong with the “law of attraction” death, the soul, and the afterlife his current projects his documentary, Quantum Activist and much more!!! 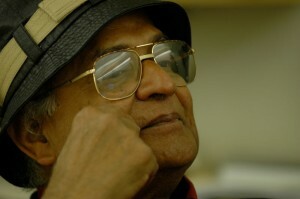 Amit Goswami, Ph.D. earned his Ph.D. from Calcutta University in theoretical nuclear physics in 1964 and has been a professor of physics at the University of Oregon since 1968. He taught physics for 32 years in this country, mostly in Oregon, before fully retiring in 2003. Dr. Goswami was a senior scholar in residence at the Institute of Noetic Sciences during 1998-2000. He teaches quite regularly at the Holmes Institute and the Philosophical Research University in L.A.; Pacifica in Santa Barbara, CA; and UNIPAZ in Portugal.